Throughout the past 10 or so years of my life, I have always craved the feeling of being healthy and in shape. I bounced around between gyms, fitness classes and tried to eat decently healthy. It always came in waves of motivation, and nothing would ever stick for longer than a few months. Discovering PT Fitness is one of the best things that has happened to me. Ever. The workouts are fun, at your own pace (AND they never get easier…), and the people I get to work out with every day are incredibly supportive and just awesome new friends/workout buddies. There is something addicting about this place, and everyone that tries it understands. My before/after photos were over the course of 5 months and were a result of me making a commitment to my workouts and following the PT Fitness Meal Plan.. Working out and eating right has (finally) become a lifestyle that know I will execute for the rest of my life and PT Fitness is the reason. After working out with this group for a little over a year and getting results that changed my life, I felt the need to pursue fitness as a career so that I could help others reach their goals and feel good about themselves. I am now a Certified Personal Trainer through NASM and am employed by the company that got me here – PT Fitness!! I would like to take the time to personally thank you, Nancy and Sharon for training me throughout the years even though I gave y’all dirty looks and cuss a lot during the workouts (like a whole lot mentally), and for pushing me, keeping me on track as much as possible, and following up with me. I could not have met and have been inspired by a better group of people. Thank you for always having my best interest. Thank you for always being honest with me and never suggesting fad diets or trends. In addition to consistently monitoring my form and suggesting modifications to prevent injuries. Thank you because you will never know how much stronger I feel mentally and physically from what everyone has taught me. PT Fitness is the best. I will truly miss PT Fitness dearly. Who would have thought 3+ years ago when I participated in a free boot camp class at Clearfork, I would be crying about leaving you guys?? My first time to boot camp, I had no idea what to expect. Within a few minutes, I felt so welcomed and knew I was going to love it. I’ve been going for 3 months now, and it has become something I look forward to each time. Ron and everybody there are awesome – encouraging and supportive. Having people that are expecting me to be there and to push myself while I am there is so helpful and motivating. I also got on the meal plan after a month of boot camp. I had seen results from others and knew I had to have both the workouts and the healthy eating to see the results I wanted. And after two months on the meal plan, I am seriously seeing those results! It has been so awesome seeing my body change and to feel so healthy. And bonus – the food on the meal plan is great! It’s really teaching me a healthy approach to eating and showing me that eating well tastes good, too! My goal when I joined Above Average Boot Camp was to be healthier, for me, and for my family. Because of that I’m healthier, I’m stronger, I have more confidence in my abilities, and…I’m having FUN!! Last weekend a friend asked me when I started getting into running. I stumbled to answer the question because it’s not running that I have taken up as a hobby, it’s PT Fitness bootcamp. I ran my first half marathon this year and just recently ran my second and my favorite thus far, the Nike Women’s Half Marathon in San Francisco. I wasn’t nervous about running at either of these events because I knew the cardio and strength conditioning at bootcamp had increased my endurance and served as my training. I have to admit, the hills in San Francisco were tough, but I felt strong (Ron’s leg day work outs paid off) and it was a great feeling! Bootcamp not only prepared me for these races, but it was what inspired me to sign up for them in the first place. For me, PT Fitness bootcamp has become more than just a work out class – I have met a group of wonderful and inspiring people who encourage each other, volunteer in the community together and who share a common passion for living a fit and healthy lifestyle. Thank you Ron and everyone at PT Fitness! I absolutely LOVE this class, the instructor and participants. Each person is encouraged to participate at their own pace. I highly recommend this fun and energetic class to anyone who is wanting to get healthy again! Sharon has been amazing! We have not made this job easy for her. We are “multi” family Managers that always can find endless reasons and excuses……… She remains positive, motivating, and inspiring despite our periodic unwillingness…… She s a tough cookie and we appreciate her more than we show, especially at times. After two months of working out regularly, I found that I felt stronger and healthier, but my clothes were still not fitting the way that I wanted. My eating habits were certainly questionable as I often let stress and a busy schedule dictate my food choices. I decided to give the PT Fitness Meal Plan a try and that is when all of the pieces to my fitness journey fell into place. After four months on the Meal Plan plus my regular workouts, I went from a size 12 to a size 6. The meal plan totally changed how I approach eating. It enabled me to prepare my meals for the entire week before the busy work-week began and the support and accountability from the community helped me stay on track. The PT Fitness Meal Plan does more than just keeping me on track with calorie intake. It ensures that I am receiving a balanced diet that will fuel me for the entire day, workouts and all! Each morning, I pack all of my meals for the day inside of a cooler. No matter if I have to work late or an appointment runs longer than expected, my healthy-eating resolve will not suffer. Eating the right types of foods evenly spaced throughout the day keeps me on track with my eating and the “I could gnaw my arm off I’m so hungry” moments don’t occur. I love the variety of meals each week. Your tastebuds to not have to suffer in order to lose weight! Some of my family’s favorite go-to meals are recipes I received through the PT Fitness Meal plan. No time is spent wondering what to eat or wondering what the portion size should be. Following the PT Fitness Meal Plan month after month has taught me how to feed myself better and my family too! This one is from Ron, but it stuck with me and helped me change the way I thought about food: Do you know what you are doing next Saturday? Do you know what you will eat next Saturday? Why not? Your food intake should be planned the same way as the other important events in your life. From my husband, David A: The meal plan has helped me support my wife in her weight loss goals. We work together to prepare the meals for the week, and if she strays from the plan, it is the community members and trainers that are holding her accountable. A bonus for a happy marriage indeed! Seeing my personal results as well as having an awesome and encouraging trainer help keep motivated. 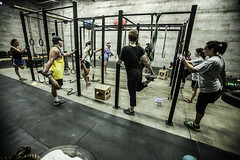 Above Average Boot Camp at PTFitness has been a great experience! Thank you for the quality time and energy you have shared with me. Your encouragement has changed my view on fitness. With your guidance I broke through many fears (carbs, jumping on steps and the arm walk on the treadmill). But most of all I learned that when it comes to lasting life changes, the journey is more fulfilling with someone by my side. You represent your brand well “Heart Power Focus”. In my culture we refer to people like you as having “chispa” (spark). Sometimes our own light goes out and we need is a little spark from someone else to light us up again. I have had the good fortune of knowing Ron Green for about seven years now and I have been in a business Mastermind Group with him for the past one and a half years. In this group we learn about and help each other grow our respective businesses. 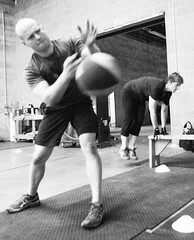 This has given me great insight into Ron’s goals and vision for PT fitness. Ron is not only a great friend but he is a man of hig h character and integrity. He truely has a passion for helping people meet their health goals and is a natural born leader. His commitment to putting on the Dirty Scurry every year, to get kids active and fight youth obesity ( Which is a hugh undertaking) speaks volumes as to what a great guy he is! I have done both personal training and bootcamps with Ron the last couple of years and have seen tremendous results! I’ve been able to keep 15 pounds off. I feel better, have more energy, better mobility and my lower back no longer gives me any problems. I can strongly recommend Ron and PT Fitness to everyone! 6 months of PT Fitnes…you tell me how it’s working!!! Thanks Ron!!! “I just wanted to thank you for helping me get in great shape these last few weeks. I can honestly say I feel like I am in the best shape I’ve ever been in and I couldn’t have done it without your help, support & knowledge! I now understand so much more about getting in shape & maintaining a healthy lifestyle. I hope to keep in touch & plan on getting even stronger & better in shape. I will let you know the outcome of the FBI. I don’t plan on reapplying so once I get word I hope to pick up some sessions to make sure I’m again ready. I just want to thank y’all so much!!! I’m very happy with what results I got and how awesome Ron was, he was extremely motivating and helpful. Which is what we need!! I’m very interested in doing it again soon. Thanks again!!! I wanted to thank you for everything you have done for my lacrosse career. Your training was instrumental in my lacrosse success and consequently my attendance to Stanford. Your intensity kept me motivated to achieve my goal of playing college lacrosse. I am so excited to play at the next level and I can’t thank you enough!